When most people think about getting their industrial components and equipment repaired, they think headaches. From frustrating online searches in order to find someone to repair it, unanswered quote requests, too expensive when you do finally get a quote, super long lead times, etc, etc. The list goes on. Almost seems like its best to just scrap it and buy new, right? Sound familiar? These are actual complaints we hear so often from our customers on their experiences before they actually find us. It is so frustrating and we are frustrated for you! But getting your motors, drives, etc repaired doesn't have to be frustrating or cause you headaches. At Precision Zone, we want to get you back up and running as quickly and as easy as possible. Take a look at this Okuma BLII-D50A AC Servo drive that came into our facility last week. The customer called in a panic because his machine had gone down and he needed back up and running immediately. Our customer was local so instead of sending us the drive for an evaluation, they simply dropped it off and we evaluated it that same day. Our technician found that this Okuma BLII-D50A Drive had bad/leaky capacitors (open, corroded traces) and found a couple of bad circuit board components. 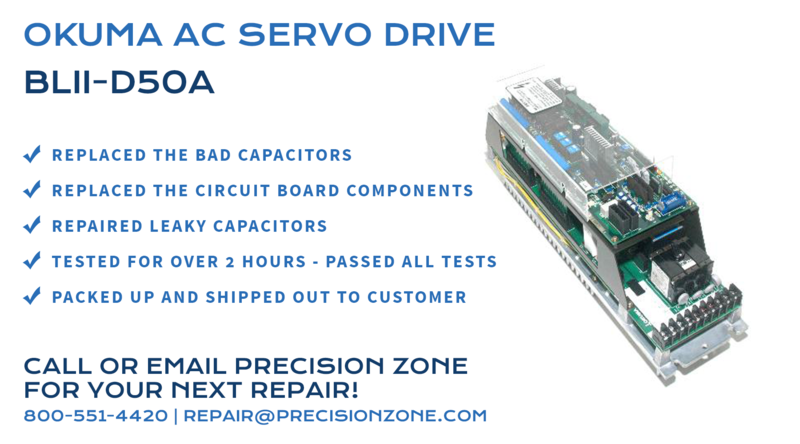 As soon as the drive was evaluated (for free) our customer care team was updated by the technician and they were able to immediately send out a quote to our customer for the repairs needed. This was only 2 hours after the drive was dropped off (we told you, we work fast). The rest was smooth sailing. The customer gave us the go ahead on the repairs needed, our technician started on it the very next day. He replaced the bad capacitors, refurbished the leaky ones, and replaced the bad circuit board components. After all of the issues have been repaired, it is our standard to put the newly refurbished part through rigorous testing. We tested this particular Okuma drive for over 2 hours. All tests came back perfect and our customer care team was notified of its completion. This customer was notified that it was finished and they came and picked it back up. Like we said, getting your repairs done shouldn't have to cause you headaches or give you the run around to find a solution fast. 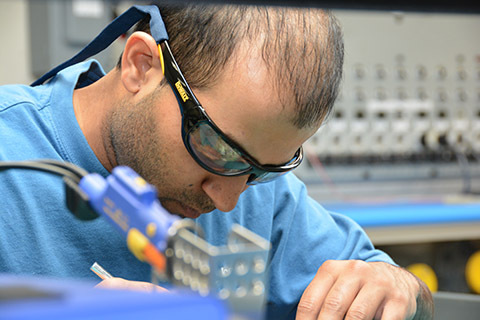 With quick + flexible service, complete simulation and product testing, full refurbishment, not just repair, decades of industry experience, and superior technical knowledge and support, Precision Zone prides itself on being your industrial repair experts and your go-to solution. At Precision Zone, we guide our clients towards to best decision that serves their business. If you have specific repair or replacement questions, get in touch with our expert customer support team at 800-551-4420 or repair@precisionzone.com.